Osaka: A Cultural Metropolis The Osaka 21st Century Plan is a comprehensive program designed for citizens, businesses, governments and other organizations to join together in promoting and organizing various international events for the purpose of transforming Osaka into an international cultural metropolis. The Osaka 21st Century Association is a nonprofit foundation co-established in April 1982 by governments and businesses, as well as academic and other organizations, towards implementing the Osaka 21st Century Plan and assisting in the development of Osaka as a global cultural metropolis.Starting with the Osaka Castle Quadricentennial,we have already carried out a variety of programs designed to promote Osaka's culture and attractiveness and have endorsed major development projects in the region, supporting the International Garden and Greenery Exposition, Osaka, Japan 1990, working from the initial stages towards the earliest possible actualization of the Kansai International Airport Overall Plan, and promoting the building of the Osaka International Convention Center. 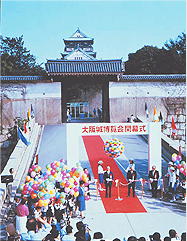 Here in the beginning of the 21st century, the Osaka area is hosting a great many major events. At the Osaka 21st Century Association, we are constantly involved in a multitude of activities towards the advancement of cultural projects in Osaka, starting with producing the Midosuji Parade which has now established itself as one of the world's most eminent parades. In addition to regularly holding such events as the Performing Arts Messe, we also sponsor musical street performances and provide educational programs, including lectures and seminars, which are designed to foster the future leaders of 21st century Osaka. Where Does This Plan Take Us?